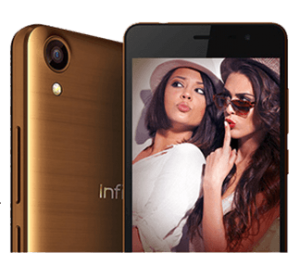 Infinix Hot Note is a powerful smartphone targeted at mid range smartphone users. 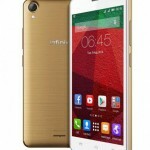 Infinix Hot Note is the immediate successor of the Infinix Hot, and it is bigger and better than the Hot in many ways. 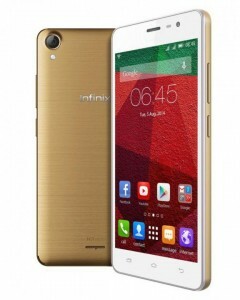 Infinix has done well in making powerful smartphones affordable for those with a tight budget. In this post, we look at the review of the Hot Note. Infinix Hot Note has a premium feel, though a bit bulky in hand, but what would you expect from a 5.5-inch device? The device has a metal texture finishing on the back and side frame. The Hot Note is 8.9 thickness and weighs about 172 grams which is not bad at all. The back camera of the device is located at the top-left corner with the LED flash right below it. While the front camera can be found on the top-right corner, and of course in front side of the device. Just like its predecessor (Infinix Hot), the power button and the volume button can be found on the right side of the device. The loudspeaker of the device is located at the bottom center, the 3.5 mm audio jack at the top side and the microUSB port at the bottom side of the device. To get to the SIM slots, you need to open the back cover. 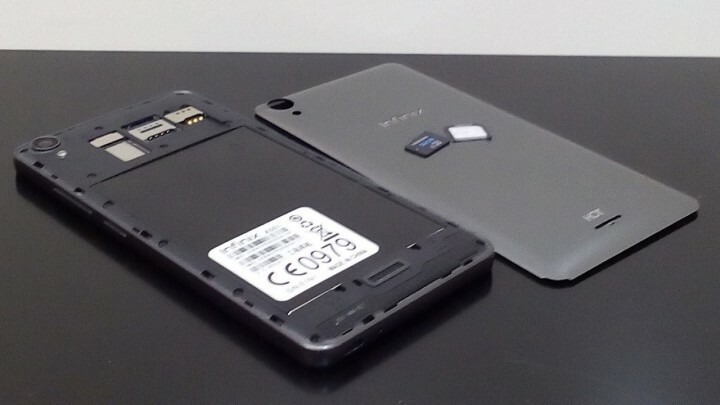 However, unlike in the Hot where the back cover wraps the sides, the back cover of the Infinix Hot Note does not extend to the sides, but sits on the back like a lid. Once the lid is off (this is very simple and requires just your finger), you will see the two micro-SIM slots for the dual-SIM function and the microSD slot at the left side of the SIM slots. Infinix Hot Note comes with a high quality high-definition display. 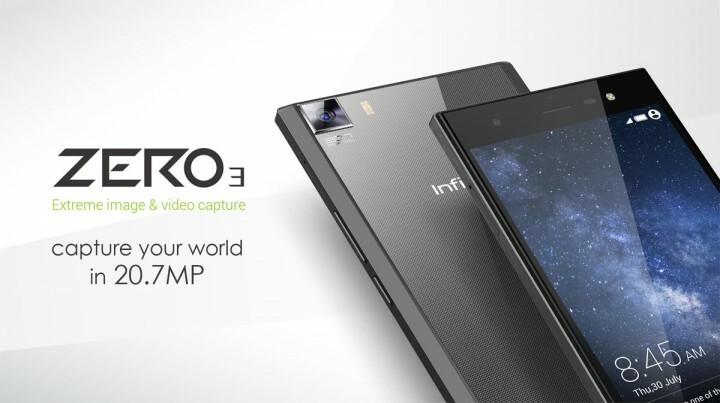 It measures 5.5-inches with 720 x 1280 pixels resolution that gives 267 ppi. The display gives accurate colour reproduction and sharp images. Just like most Android devices, the brightness of the screen can be controlled manually or you can set it to automatic brightness so the Note regulates screen brightness depending on the ambient lighting. 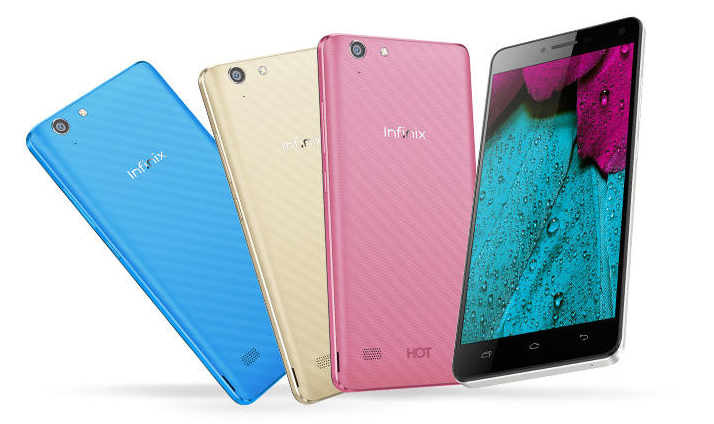 Infinix Hot Note comes only in the 1GB+16GB version but comes in many different colors. The Hot Note comes with 1.4GHz MediaTek MT6592 Octa-Core Cortex-A7 processor, with Mali 450-MP4 GPU that delivers powerful and consistent performance. Its 1GB RAM combines with the processor to provide a seamless web browsing experience and enables you to multitask without facing any time lag. Though the 1GB RAM may be considered as a draw back, but it is hardly noticable. You can run a range of Android applications on this device as it is equipped with the Android 4.4.2 KitKat operating system. 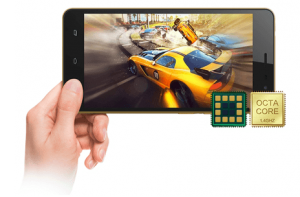 Infinix Hot Note is equipped with 1GB RAM and 16GB internal storage that is expandable to up to 64GB via the use of MircoSD card. Given the hardware configuration of the device, the device is expected to perform well and it didn’t disappoint. 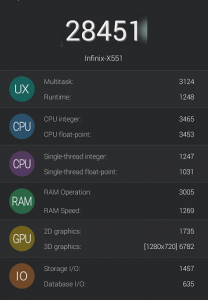 Infinix Hot Note scored 28451 points on the AnTuTu Benchmark, which places it ahead of the HTC One M7 and Xiaomi’s Redmi Note. 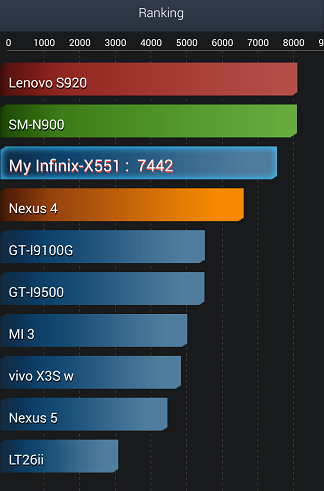 In the performance explanation, the Infinix Hot Note performed better than 95% of devices in general performance. 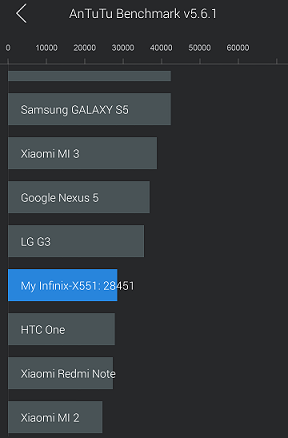 Infinix Hot Note also performed better than 60% of devices in game performance and better than 50% of devices in battery performance. 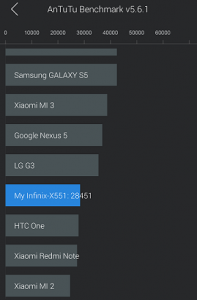 The Infinix Hot Note X551 is WiFi, 3G, and 2G enabled. The Wi-Fi model is 802.11 a/b/g/n. The device also features Wi-Fi hotspot, DLNA and Wi-Fi Direct. You can make video calls, share images, documents and more with your friends almost instantly on the smartphone. It also has Bluetooth 4.0 connectivity, through which you can transfer data to other Bluetooth enabled devices. Its dual SIM card feature provides you with convenience. Hot Note comes with 8MP rear camera with LED flash and 2MP front camera for selfie, which supports 75 percent wide angle shooting for easy recording of pictures. The camera enables you to record HD videos at 30fps. Both cameras offer zero shutter delay (ZSD) so you can take photos faster without delays. Face Detection, Geo-tagging, Gesture shots, and many other features are all available on both cameras. Powered by a 4000mAH lithium polymer battery, this device provides you with an extensive runtime even with heavy app usage. 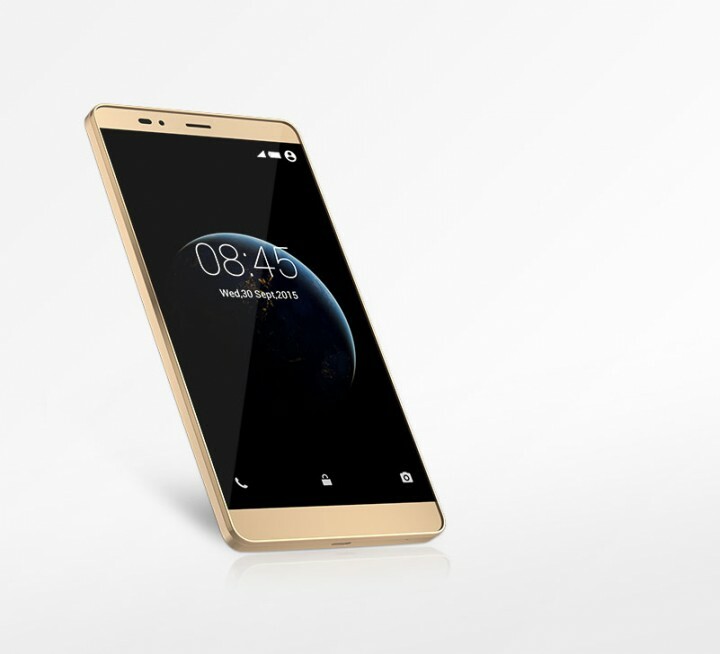 The smartphone provides you with a usage of 21 hours of talk time on 3G, up to 8 hours of video playback, 40 hours of music playback, and 6.3 hours of Internet surfing. Along with this, the battery gives you a standby time of 600 hours. 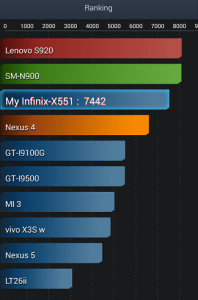 From the test result above, it can be seen that the Infinix Hot Note battery scored an 7442 points ahead of the duo of the Nexus 4 and Nexus 5 as well as the Galaxy S4 and Xiaomi Mi3. 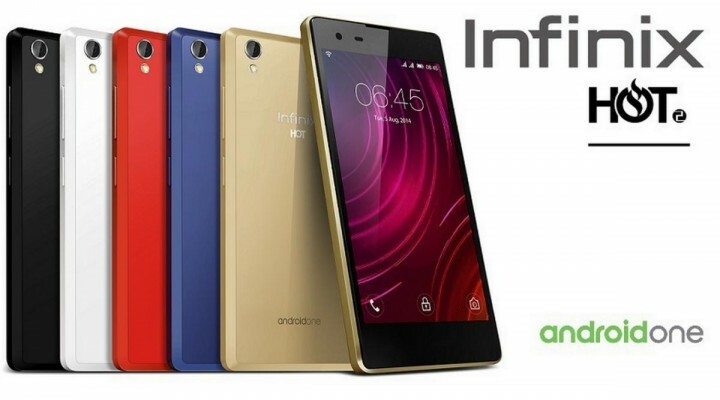 Infinix Hot Note is available in Nigeria at a price of about NGN 25,000. You can get the device on many online retail shop in Nigeria such as Konga.com, Jumia, etc. 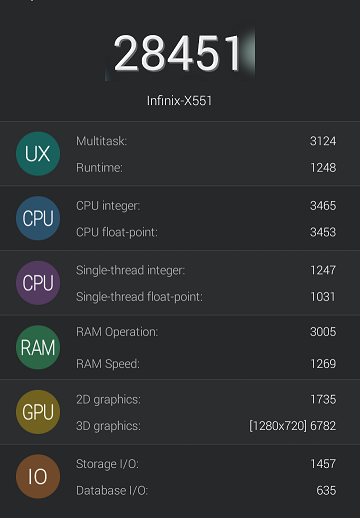 Click here to see full specs of the Infinix Hot Note.